The Club’s main focus is on dinghy racing in particular in the core classes; details about the classes we race at present (our core classes) are shown below. The various classes start together which means that members who have different boats are all able to race against the established classes on a handicap basis. If several new boats from the same class come along and race regularly they will be able to form into a fleet of their own and, if they wish, have a separate start of their own. As we use the RYA Portsmouth Yardstick (PY), which enables boats of different types to race against one another, then any dinghy with a PY between that of an Optimist and an RS400 can be raced. However, we would you encourage you to consider sailing in one of the classes that we currently race, especially if you are new to the sport. These are boats which are especially suitable for our lake and are capable of being sailed well to their handicaps. Prizes are also awarded to the winners of various series in the classes that we currently race as their results are awarded both in the handicap races as well as by individual class. If you are looking to buy a new boat or change class, please appreciate the sheer number of different dinghy classes that are available for you to choose from. In fact, there ae so many to choose from it’s totally bewildering. Some are produced in large numbers and others are aimed at a niche market. Some have fallen from popularity or have simply not sold in great numbers. Experience has shown that quite a few people taking up sailing purchase inappropriate boats. Before too long they are lost to the sport, either through frustration at not being able to satisfactorily sail and thus enjoy the boat they have chosen, or because they have purchased a boat that has seen better days and you seem to spend more time repairing it than racing it. The main boats that we currently race (details of which are shown below) enjoy popularity both at Hollingworth Lake and other clubs. This means that there is usually an active second hand market both to buy your first boat from and to sell into when you are ready to progress to the next level or if sailing turns out not to be for you. The Topper is a very popular singlehander for junior, youth and lighter adults that has two rig options (4.2 and 5.3). It’s fast, light with a durable polypropylene hull (that makes the boat virtually indestructible) which can be easily righted even by a smaller crew. The Topper is simple to rig & maintain. The Topper 4.2 is the ideal introduction to sailing for smaller lightweight sailors from age 9 (35kgs) up. 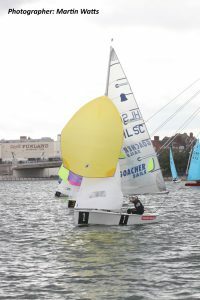 The Topper 4.2 offers the perfect pathway into the Topper 5.3 and then beyond into classes such as the Laser 4.7, Laser Radial, Laser or 29er. 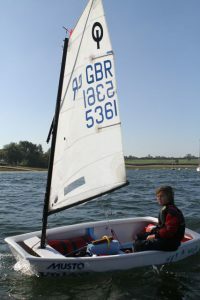 Sailing a Topper has certainly helped our youngsters to acquire key life skills to help them fulfil their true potential including independence, confidence, team work and physical fitness. The Topper Class is fun and friendly and, at a national level, has been responsible for developing some of the best young sailors in the world. 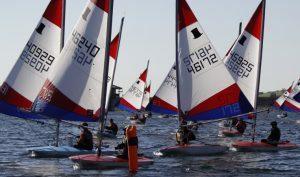 The RYA’s British Youth Sailing programme is the envy of the world and the Topper is an integral part of the programme that gives young dinghy sailors the best possible opportunity to develop their racing talent towards Olympic Class sailing. Rio Olympic Gold medallist Giles Scott is yet another excellent example of young sailors following the Topper pathway with great success. The National Solo is a classic, one-design, single-handed dinghy. Designed by Jack Holt in 1956, the Solo is sailed at many clubs in the UK, Holland and Australia. Originally designed in wood, competitive boats are now widely available in Fibre Reinforced Plastic (FRP) or composite construction (FRP hull and wood deck) as well as wood. The new FRP boats have re-vitalised the class and it is now as popular as ever before giving close racing at many events. Features of the boat include light, double-chined hull, inward sloping decks for comfortable sitting out and a fully battened sail set on a deck stepped mast. 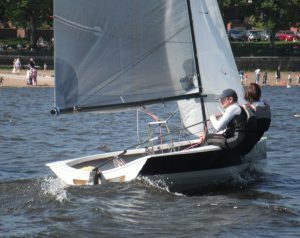 The Laser is probably the most widely built, sailed and raced dinghy in the world. The philosophy behind the single-handed boat is that with identical hull, sail and equipment, the only difference from one boat to the next is the helm, thus ensuring close competitive racing. Although now elevated to an Olympic class, the Laser provides affordable racing in many places. There are 3 simple interchangeable rigs to suit the junior/novice sailors, youth sailors up to the full rig (7.06m2) for top level sailors. A unique step-by-step progression in the same class, with the only difference being the sail and lower mast. With the full rig, the Laser is an exciting and hard boat to sail when it is windy: Be prepared for the odd capsize! HLSC has a small Laser fleet. 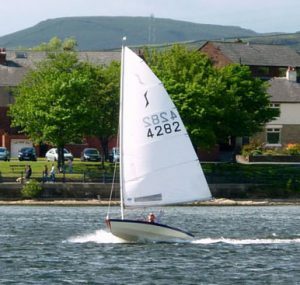 A useful feature is that experienced members can test their skills by hiring one from the Hollingworth Lake Activity Centre. 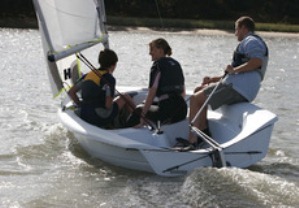 The GP14 is one of the most widespread dinghies in the UK. This 14ft dinghy was initially designed with a main and small jib as a comfortable family dinghy. With its full rig of mainsail, large genoa jib and spinnaker it is now an exciting racing boat. GP14s are used for all levels of sailing, from training beginners through club racing to competing on the Open Meeting circuit. At 14ft long the GP14 is sailed by people of all ages and even for competitive racing there is a wide tolerance of all-up crew weight. The club has an active fleet of GP14’s with a range of boats from a 25 year old wood and fibreglass GP to the latest series II boats. The GP14 is a well-established class that provides good racing at HLSC at all levels and for all ages. The Merlin Rocket is a fourteen-foot dinghy that is light, fast and responsive; it is an out and out racing machine. It is a pleasure to sail in all wind strengths and on all types of waters and a thing of beauty to own. The Merlin Rocket is a restricted class built to a set of rules rather than a plan. Thus the hulls and rigs of individual boats vary within given limits, enabling you to tailor your boat to suit your weight, sailing water and temperament. With the 10m2 large spinnaker, they are fast challenging boats to sail, and good team-work is a key to success. Keen male and female teenagers with knowledge of racing can find themselves in great demand, as these boats are best sailed with fairly light crews. It is not recommended for novices. For more information about these classes, please go to their class website by clicking on the relevant class name. Both an aerial photograph and a plan of the lake showing the approximate positions of our club marks can be viewed in The lake section (under About Us) of this website. 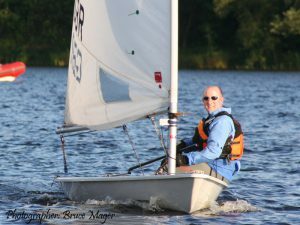 What dinghies do we use for training? The RS Vision is a good boat for training, being stable and with plenty of room for two adult trainees and an instructor. The boat is fitted with the Gnav kicker system leaving the cockpit uncluttered. A boat that is roomy, stable and great to sail. GP14s are also used for adult training. The Optimist is a small, single-handed dinghy intended for use by children up to the age of 15. Optimists are used for beginners, but most sailors continue to race them up to 14 or 15 years of age. Very small children are sometimes “doubled up” but usually the boats are single-handers. In this mode children gain confidence and improved skills. “The small boat that trains the champs”. HLSC, like many other training centres, own a number of them and they are the first boat most youngsters will sail. The Optimist is the biggest youth racing class in the world. 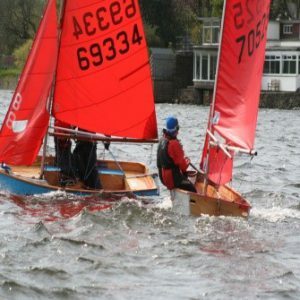 This small 3.30m long blunt bowed dinghy with its red sails can be seen on almost any stretch of water in Britain. The boat is an excellent primer as it is virtually foolproof and can be sailed in strong winds by relative novices. At HLSC our Mirrors are also used for youth & junior training. For details of our training, please go to the Training at HLSC page of the website.